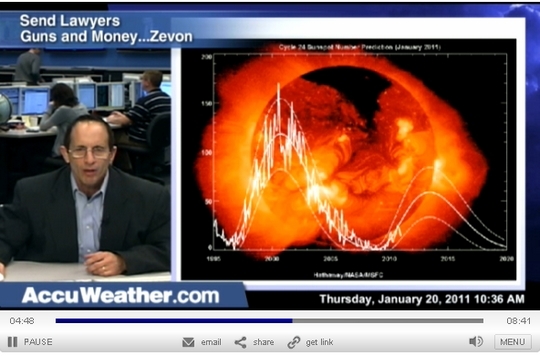 CLICK for MUST SEE VIDEO link from Joe Bastardi/AccuWeather.com he has a lot to say about the current downgrade of SC24 and the current cold winter. The winters of the past two years have been noticeably colder. The northern hemisphere in particular has experienced record cold, record snow and a rebuilding of the Arctic sea ice extent. The southern hemisphere this winter has also seen record low temperatures in South America which is resulting in many hundreds of deaths (human and livestock). There are a number of players involved which can be attributed to this cooling trend and when they come together they are capable of dropping the world's temperatures by a significant amount. Perhaps the most important player is the Pacific Decadal Oscillation (PDO) which is a hot and cold ocean temperature cycle in the Pacific of about 30 years. The world's temperature trend very closely matches this cycle which has the potential to override solar activity of the day. The last major PDO cooling event was between 1946 and 1976 which experienced the highest solar cycle on record (SC19) followed by a low cycle (SC20). The deepest cold of this era was recorded when both the PDO and low solar activity teamed up, which is right where we are again today with perhaps a greater influence from the solar side with my predicted imminent grand minimum. It happened in 1816 and is bound to happen again. In 1816 the northern hemisphere suffered through the year without summer. During the previous winter the Mt Tambora volcano erupted. Thousands froze to death due to the bitter cold the atmospheric ash clouds created. Frost killed most of the early crops as late as May that year in North America. Frost and snow killed even crops more in June. Riots, arson, and looting flared up in Europe as common food stores became scarce. Lake and river ice were recorded in Pennsylvania in July and August. 1816 also was a year of historic low solar activity as measured by 1816 era telescopes counting sunspots. We are currently experiencing another prolonged solar minimum. Even with 21st century telescopes we can see that the sun is only producing tiny sun specks and weak sunspots. “From my long-range astronomical calculations for North America, I've forecasted 2010-11 to be a very strong El Nino year. This is caused mainly by the activity of the Sun, which will undergo a historic solar maximum that will bring to an end the 36-year global warming phase that began in the year 1980 while opening a new global cooling phase that will get underway by the year 2017. In the meantime, I am also forecasting that the years of late 2009 to 2016 will feature some of the world's wildest climate and weather events of the early 21st century that, by the mid-2010s, will have seen the close of the current 36-year phase of global warming that Earth has experienced since 1980. By 2010, in my estimation, we will have entered the 30th year of Solar-forced global warming. These last six-to-seven-and-a-half years, from 2010 to about 2017, will likely feature some of the warmest global temperatures recorded in the entire 36th year global warming cycle. This cycle, like that of global cooling on its way in the decades ahead - is directly caused by the Sun.